Inside Self-Storage Store. DVD - Is Now the Time to Invest in Boat and RV Storage? DVD - Is Now the Time to Invest in Boat and RV Storage? Get an overview of boat/RV storage to determine if it’s right for your business, including current trends, considerations for site selection and construction, potential tax incentives, finance tips, and more. 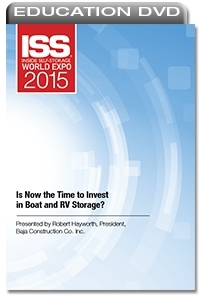 Speaker: Robert Hayworth, President, Baja Construction Co. Inc.
Is Now the Time to Invest in Boat and RV Storage?